Now we all know the concept of the student beating the master and I don’t want to imply that my friend Diana was ever my student or that I was ever her master (though I was her roommate, which is kind of the same thing with me); what I’d like to imply, however, is that Diana–who was a timid cook when I lived with her–is now giving me a run for my money. I remember her not wanting to make a salad in front of me, back then, because she thought I’d be judgmental. Since then, and since moving in with her husband, she’s had a chance to hone her chops and by all accounts her chops are very good. Case in point: check out her potatoes. 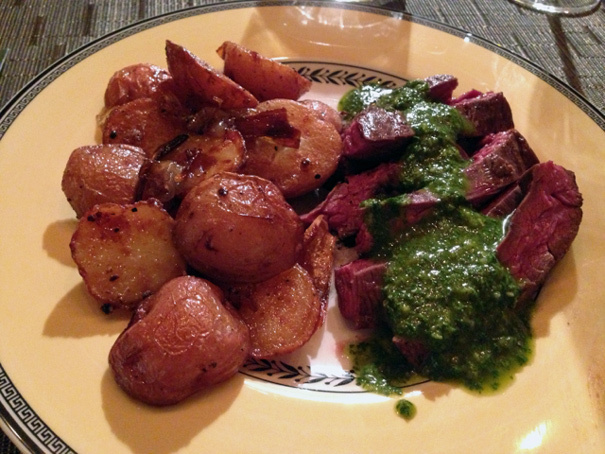 A few weeks ago, Diana served up a dinner of flank steak with chimichurri sauce, an excellent pairing indeed. But the real star of the show was a side of roasted potatoes that seemed familiar enough until I bit in. There was the requisite crunch you expect from a roasted potato but then there was also a beguiling sweetness and creaminess. “Why are these so good?” I demanded. People, the student has indeed beaten the master or, rather, the roommate has beaten the roommate. These are some killer potatoes. It’s such a simple idea but makes such a huge impact. So follow Diana’s lead, next time you make potatoes: get a cookie sheet, cut red potatoes in half, add them to the sheet and coat them in about 3 tablespoons of melted Kerrygold butter. Sprinkle with salt and pepper and pop into a 425 oven until they’re golden brown all over and a knife goes through one easily.